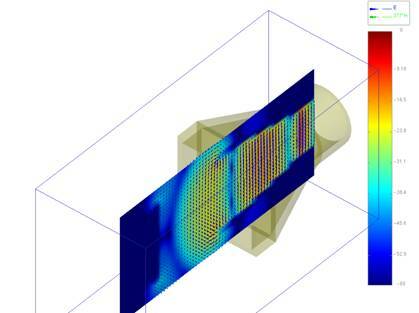 Electromagnetic particle-in-cell (PIC) simulation is an important design prototyping step in research and development of high power microwave sources and other high power microwave applications. 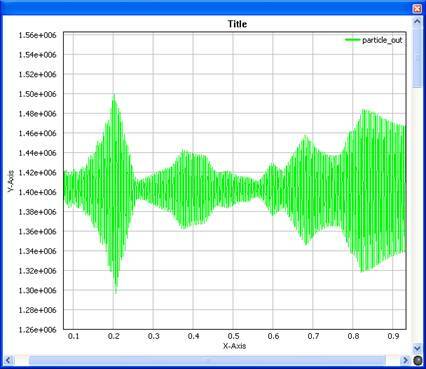 Wavenology EM software tool are developed with a advanced module for the PIC simulation. With the PIC module, the user can design a complex geometry for an PIC problem. 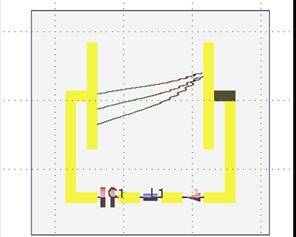 The first example is used to demonstrate that circuit elements work well within Wavenology EM in the EM-PIC simulation. Two different circuit elements: the capacitor and the inductor, are employed. Several particles are loaded between two metal plates connected through a circuit with a capacitor and an inductor. 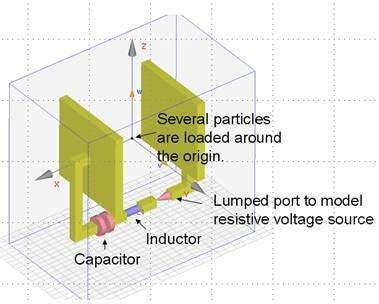 An active lumped port is used to model a resistive voltage source. The design is shown in Fig. 1. And the loaded particles are shown in the particle-loading dialog in Fig. 2. Fig. 3 shows the simulation results of the particle trajectories. Fig. 1. Particle loaded between two metal plates powered by a circuit. Fig. 2. Loaded Particles between the two mental plates. Fig. 3. The trajectories of the particles between the two metal plates. Red denotes positive-charged particles, while green denotes negative-charged particles. The positive-charged particles and negative-charged particles move in opposite directions. The second example is a simple model of CRT, as shown in Fig. 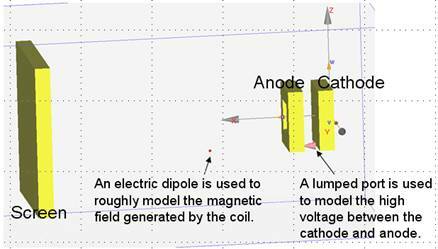 4, where a lumped port is used to model the high voltage between the cathode and anode. An electric dipole is used to roughly model the magnetic field generated by the deflection coil. A metal plate is used to model a screen to collect the emitted particles. Fig. 4. A simple model of cathode ray tube. A static particle is loaded at the cathode. Its simulated trajectory is shown in Fig. 5. 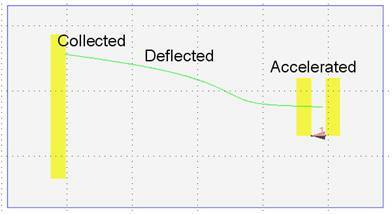 We can clearly see that the particle is accelerated between the cathode and anode, and is deflected by the magnetic field generated by the dipole, and is collected by the screen. Fig. 5. The particle is accelerated, deflected and collected. 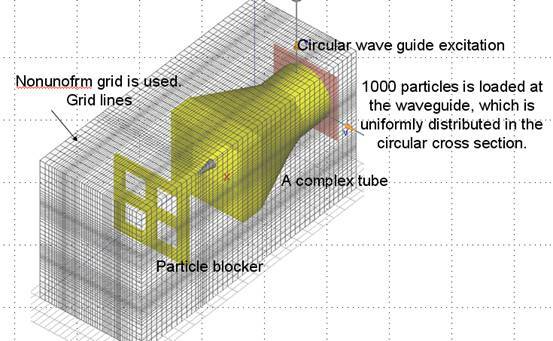 A traveling wave tube uses a helix slow-wave non-resonant microwave guiding structure. 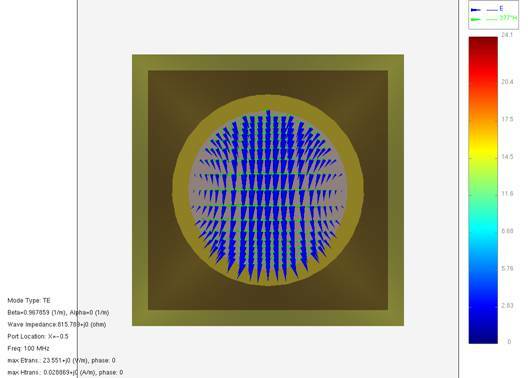 The electron beam from the cathode continuously interacts with an axial RF input field over a long distance inside the helix where both velocity and density modulations of the electron beam occur. Here a simple model of traveling wave tube, as shown in Fig. 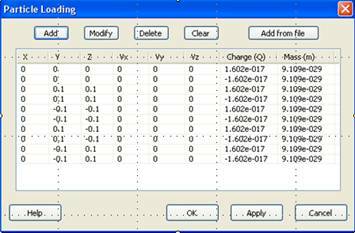 6, is used to simulate the velocity modulation. Fig. 6. A simple model of a traveling wave tube. The helix guiding structure is powered by a sinusoidal signal through the lumped port. 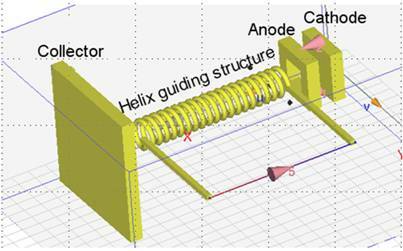 Note that a new geometry shape, the cylindrical helix, is used to model the helix guiding structure. The helix guiding structure is powered by a sinusoidal signal through a lumped port. A particle is loaded at the cathode. It is first accelerated by the high voltage of the anode, and then passes through the helix region by interacting with the input axial field from the helix guiding devices. Fig. 7 shows the simulation results of the velocity of the particle when it passes through the helix guiding structure. Fig. 7. Velocity modulation of the particle inside the helix guiding structure. X-axis is the position, while the Y-axis is the velocity of the particle. 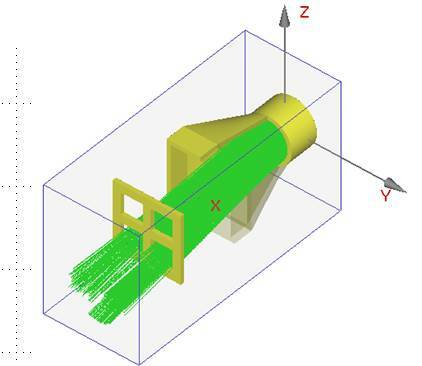 The last example is associated with multiple particles in a tube excited by a waveguide mode. The tube has a circular inlet and a rectangular outlet. Between the two different shapes of the inlet and outlet, lofting operations are used to make them change to each other smoothly. The geometry is shown in Fig. 8. A TE mode is excited in the tube inlet. The excitation pattern is shown in Fig 9. A particle blocker is put at the tube outlet. 1000 particles are loaded. A field snapshot at a cross section is shown in Fig. 10. And all the trajectories of the particles are shown in Fig. 11. Fig. 8. Multiple particles are loaded in a tube excited by a waveguide mode. Fig. 9. A TE mode is excited at the circular waveguide. Fig. 10. A field snapshot at a cross section. Fig. 11. Trajectories of all the particles in the tube. © 2005-2017 Wave Computation Technologies, Inc. All Rights Reserved.